In the Western Hemisphere, the FAX machine (short for facsimile) is slowly becoming as obsolete as the typewriter. Although some businesses might maintain some kind of FAX capability to receive "signature" copies, the technology overall is slowly being phased out with the acceptability of PDFs via emails and other forms of electronic transmissions. Fortunately, this is not the case in the Japanese business culture, as it is the one form of communication that just might save the dolphins of Taiji. Yes, according to a recent article, "the clunky device has fallen out of favor in so much of the world, a refuge for dust bunnies and stray cover sheet. . . but it (does stay) humming (in Japan)." And in a grassroots campaign called, "Save Misty, The Dolphin," its just that cumbersome outdated device that just might make all the difference. The 2009 Academy Award movie "The Cove" shed light on the horrific treatment of dolphins in Taiji. In a previous post, titled, "Dolphins Got A Ticket To Ride, But At What Cost," I reviewed the documentary that exposed the major livelihood of Taiji fisherman who were responsible for the hunting down of dolphins in a bloody annual carnage. The film highlights how migrating dolphins are corralled into a cove and brutally stabbed to death for material gain. Even though dolphin meat is laden with high levels of toxic mercury, in Japan it is sold for food. Misty's story is told in graphic detail on the website to motivate people in the West to further expose these practices in hopes that governments and other global authorities will step in. Japan permits about 20,000 dolphins to be hunted each year. From September 2010 to March 2011, representatives of Sea Shepherd Conservation Society were in Taiji documenting the bloodshed. While they could not intervene without risking being imprisoned or deported, they did observe and were able to share these horrors with the world. It was their investigative reporting that revealed the plight of Misty. As the story goes, based on this campaign and the FAX machine, a committed international army of compassionate people worked tirelessly around the clock by FAXing requests to the Fishermen's Union, resorts, the mayor and the Japanese Embassies in the US, UK, Australia, New Zealand and Germany - whereby ultimately Misty was saved. But it doesn't stop there. Additional pressure needs to be applied. The "Save Misty, The Dolphin," campaign provides a link to a FREE FAX service available for anyone that wants to help save Misty's fellow dolphins. As directed on the website, the free service will allow you to send 2 FREE FAXES PER DAY RIGHT FROM YOUR COMPUTER! YOU DO NOT NEED A SEPARATE FAX MACHINE! 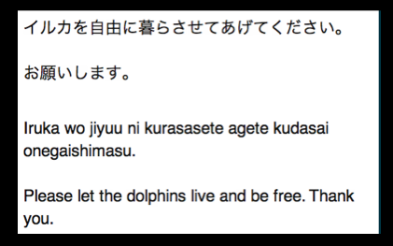 In Japanese characters, the message should read: "PLEASE LET THE DOLPHINS LIVE AND BE FREE. THANK YOU." So all you need to do is cut and paste this message into your FAX. Please consider FAXing your request today! These gentile mammals need all of our support, love and protection. 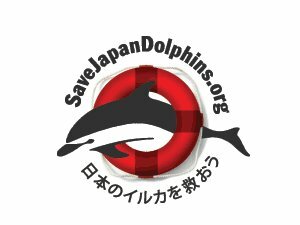 And readers, please let us know your thoughts and other similar initiatives that might be underway around the world to save the dolphins of Taiji.